We all know the saying... "There is no time like the present". Well, with all due respect, I might just disagree. Fashion speaking, it's hard to know exactly what trend will roll around the corner next, but thankfully for us, Vintage is ALWAYS in! Recently, the western fashion world has exploded! Whether you're a sassy Grandmother sporting some custom revamped Canty Boots or a Victoria Secret model rocking some serious quality felt lids, mixing our favorite Western wear with retro pieces is a sure-fire way to stand out from the crowd! Recently, a friend and I stumbled across the smallest little western wear store while visiting Colorado Springs. I was ecstatic to have found some truly genuine vintage western pieces that were also in my price range! I snagged this Rockmount Western Wear blouse for next to nothing and I can't get enough of those retro vibes! I paired my blouse with my Kimes Ranch Jolene jeans and flat brim Warbonnet Hatworks hat for a truly effortless and vintage look! 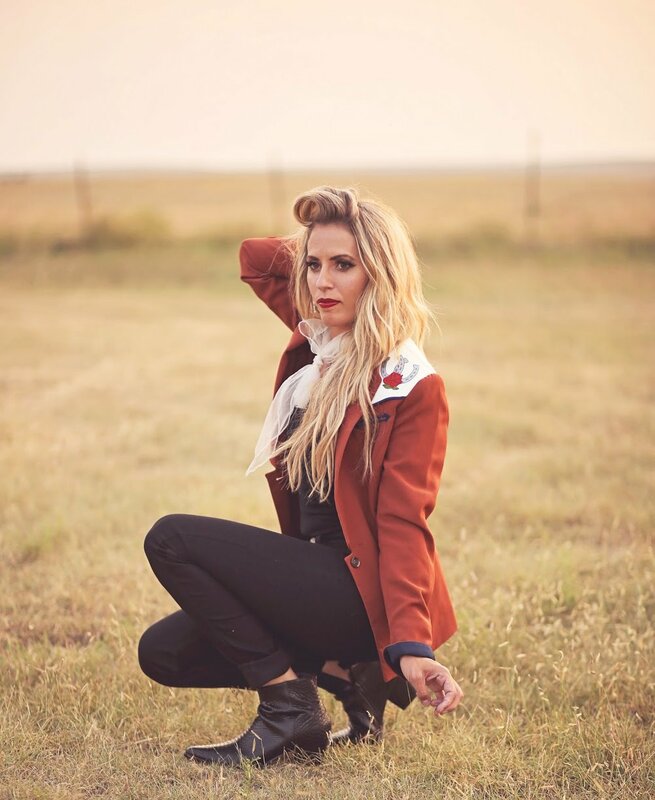 For my second retro-inspired look, I channeled my inner Annie Oakley for another effortless outfit that's sure to keep those vintage vibes rolling! I recently purchased this rust colored blazer online and knew immediately that a revamp was in store. I turned this plain blazer into a vintage dream by adding some embroidery and also adding some western yokes. I love that I can showcase my love for that retro-western fashion but remain comfortable and functional! I paired my custom blazer with my Kimes Bonnie Skinnies and some simple black booties. I'm looking forward to Fall and the more opportunities to show off this look!